The only long-term sustainable solution to wildlife conflicts around the home or on the farm is to exclude wildlife, either by directly inhibiting their access, or changing the environment in a way that makes it no longer attractive or hospitable. 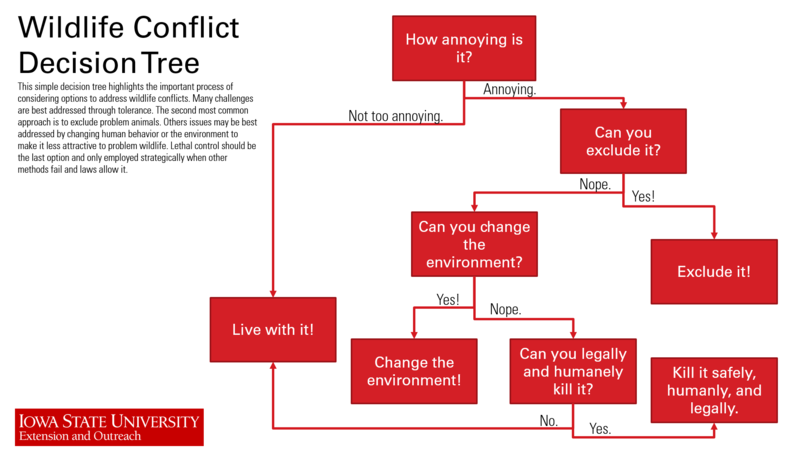 Check out our Wildlife Conflict Decision Tree to help think about the best approach for resolving your wildlife damage issues. If exclusion is not a viable option, or attempts to exclude wildlife through changes in the environment or direct barriers like fences were unsuccessful, the next step in the process may be to try a repellent. Repellents are either scare devices, like moving objects or loud noises, or chemicals that cause a non-lethal undesirable taste. Many commercial products are available for repelling wildlife with mixed effectiveness. If exclusion and repelling techniques do not work, lethal control, through trapping or pesticides may be a viable option. However, many wildlife species, including almost all birds, game animals, and threatened or endangered species, are protected during different times of the year, so be sure to check with your local Conservation Officer or work with a certified wildlife control operator to resolve your issues. Check out our helpful key to diagnosing holes and other damage to turf-grass. There's something eating my crops. What is it and how do I control it? 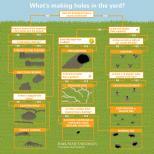 What's digging burrows around my house or shed? The wildlife are eating my garden! What are these animal tunnels on top of my yard after the snow melted? I've got bats using my house for a roost! Woodpeckers are excavating in the side of my house. The Internet Center for Wildlife Damage Management is a comprehensive website developed at the University of Nebraska to serve as a central, national clearinghouse of information on wildlife conflict resolution throughout the country. Answers to many questions about identifying damage or abating issues can be easily found on the site. The Living With Wildlife website developed by the University of Illinois Wildlife Extension program is an excellent resource for dealing with wildlife damage issues we share with our neighbor to the the east. This series of publications was developed by wildlife extension specialists at Iowa State to provide some basic information on the biology of wildlife species that commonly cause problems around homes or farms in the state. Each article starts with a basic description of the animal and its ecology and then discusses ways of diagnosing depredation or damage caused by the species and ways to abate those issues. Each link will open a download the PDF version of the article.